Get amazing eyes with mirror tinted contact lenses that let you see out when others can't see in. 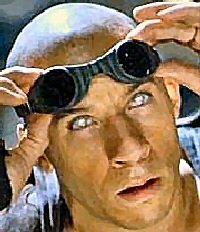 Mirror contacts have been highly popular ever since they were worn by Vin Diesel in the Chronicles of Riddick movie. They are just one of many decorative fashion lenses that have a colored tint on the outside, whether it be a spiral effect, an actual color like red (great for the vampire look!) or, in this case, mirrored to give an unusual glazed look. The wearer can see perfectly through the lenses and mirror contacts are available with or without prescription. If you don't normally wear contact lenses to correct your vision, then you need to look for so-called plano contacts; these are lenses with zero power as opposed to say -2.5 for someone who is short-sighted. It's worth remembering that some mirror contacts on the market are proper theatrical ones that cover the entire eye and not just the iris and pupil; these can take quite a bit of getting used to, even for those who are regular contact lens wearers. When searching online for mirror tinted contact lenses, look for retailers who are FDA (US Food and Drug administration) approved. Why? Because there are many unscrupulous companies out there offering cheap cosmetic contacts that can harm the eyes. Tip: I've searched MANY online sites looking for quality mirror lenses and they are VERY hard to come by as a special coating is required to enable wearers to see THROUGH the lenses. You won't find any ultra cheap mirror lenses, but my buy mirror lenses page will give you some alternatives. "Consumers should understand that decorative contact lenses, like contact lenses intended for correcting vision, present serious risks to eye health if they are distributed without a valid prescription and proper fitting by a qualified eye care professional." "The FDA will aggressively use the full range of its statutory authorities to prevent the distribution of these potentially dangerous products directly to consumers." While it is a requirement for any retailer selling contact lenses, zero powered or not, to request a prescription from the patient's optician, many retailers do not, especially those selling cheap non-FDA approved contact lenses. Clean and disinfect lenses prior to wearing and make sure hands have been washed and dried thoroughly. Do not wear mirror lenses longer than 8-10 hours maximum; they are thicker than normal soft lenses so will be less comfortable. Don't fall asleep after a heavy night - these lenses are NOT extended wear contacts. If you do fall asleep, you may find it difficult to pinch them out. Be sure to go through the process of cleaning and disinfecting after use and store them in a clean lens case filled with fresh contact lens solution. Please don't skip this step as you are likely to be storing the lenses for some time between each wear. Don't let your friends try your new lenses - infections can result! Think of them as personal items that you really wouldn't want others to try on.